Connect your Twitter profile to your journal website! From ensuring that peer review runs smoothly to promoting new articles online - there are many aspects of the publication process that journal editors have to manage. At Scholastica, we’re constantly building out our peer review and open access publishing software with new features to help editors improve their journal’s workflows and online presence. 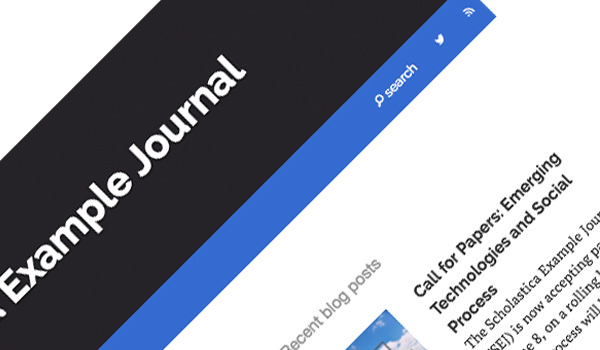 This month, we’ve introduced some great new features to help journals promote their articles online, easily organize back articles and issues, and ensure anonymized peer review. We’ve added the option for journals using Scholastica Open Access Publishing to connect their Twitter profile to their journal website for more effective online promotion. When you integrate your Twitter profile with your journal website, visitors to your website will see a Twitter icon in the top navigation bar that links to your journal’s Twitter profile. Journals that integrate their Twitter account and journal website will also get the benefit of Twitter cards. With Twitter cards, when you or someone else shares a link to one of your journal’s articles on Twitter a “card” will automatically be generated to accompany the post that contains the article image and a brief description, to make it more eye-catching in news feeds. In recent years, more and more academics have taken to Twitter, making it one of the best social media platforms for academic journals to promote new articles and issues. If you don’t already have a Twitter profile for your journal we recommend setting one up. In this blog series we explain how to set up a journal Twitter profile and grow your following. As journals transition to Scholastica Open Access Publishing, we know that many have past articles and issues to add to their Scholastica website, which you can easily do by following these instructions. Now, when your journal brings past content into Scholastica you will also have the ability to set its publication date to match the original. Editors can set a publication date for articles and issues, both before and after they’ve been published, via a new publication date field in the article and issue creation forms. Publication dates that you apply to unpublished articles will appear in the published version. When publishing new content, you may leave the publication date field blank - Scholastica will automatically set the publication date to the date/time of first publication. We’ve also added a publication date field to the blog post creation form. So if your journal is moving content from a prior blog to the blog on your Scholastica website, you’ll be able to date your past posts accordingly. Finally, we’ve made it easier for editors to ensure anonymization throughout peer review by adding automatic metadata anonymization for PDF files when they are attached to decisions. So all of the metadata in PDF files that editors attach to decisions will automatically be parsed and updated to ensure that there is no identifying information within the file. We hope you enjoy these new features! As always, if you have any questions please don’t hesitate to contact us at support@scholasticahq.com!